The team at BiGDUG are passionate about getting you organised. Whatever warehouse, garage or industrial unit you are toiling with, BiGDUG will put you in touch with the finest storage solutions around. A UK favourite, BiGDUG was founded in 2004 and offers great value for money across a range of effective products and helpful services. From the home to the office, now you can look forward to a little more clarity once everything is soundly put in its place. Racking and shelving are popular categories, offering many a sprightly solution to bike, tyre, garment storage and the list goes on. From heavy duty pallet racking to systems for your van, both domestic and industrial storage needs can be catered to. The variety is unfathomable at BiGDUG and it’s not all heavy duty either, you’ll come across simple boxes and containers to help you pack all those bits and bobs away, toolboxes will keep your space clear of unsafe objects, while lockers and hazardous goods containers can ensure that every zone is safe and secure. How do I use my BiGDUG discount code? Choose a discount code to copy and head to bigdug.co.uk to shop using our link. Click ‘buy’ on the product of your choice and go to view your basket. Click ‘Got A Discount Code?’ and enter yours. Click ‘Apply’ and continue to check out with your savings from BiGDUG. Sign up to the BiGDUG newsletter to get great saving opportunities and product news sent straight to your inbox! Where can I find BiGDUG instructions? For assembly sheets, manuals and more, simply search by stock code or your product description to download the files you need. Can I cancel my BiGDUG order? Provided that it has not been dispatched, you can email info@bigdug.co.uk to cancel your order. Can I order a BiGDUG catalogue? You can request a BiGDUG catalogue for free online. UK Delivery starts at £12 and is FREE on orders over £350 (excluding VAT). Next Day and Saturday Delivery options are available, check online for prices dependant on different order values. You should request to return your items within 28-days of their receipt and delivery charges will not be refunded. Terms and Conditions apply. Email BiGDUG: info@bigdug.co.uk or use the live chat. Need to get organised? 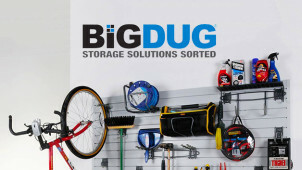 Storage is often the way to go and with experts like BiGDUG at hand, it’ll be a doddle to kit out your garage, work unit or other cluttered space. A BiGDUG discount code will let you witness exceptional shelving and racking alongside nifty packing and storage services too. All the products are of great quality and you’re sure to get your money’s worth too, all while you finally get on board with class storage solutions! BiGDUG is a customer favourite, always delivering above and beyond in both its products and service. You can read sterling reviews and ratings on each product page, so from your galvanised shelving to garage storage - you can see what others are saying first before you make your investment! A little shelving can go a long way and BiGDUG has a range which is purposely designed to withstand both light and heavy loads, suitable for an array of different home and industrial environments. Your BiGDUG voucher code will let you save on a variety of ranges to suit your storage needs. With greater storage capacities for your garage, warehouse or perhaps you have a commercial kitchen - BiGDUG has the perfect solution.